December 2017 - Pebbles, Inc.
Hi Pebbles Friends! Amanda here, and I trust that you all had a very Merry Christmas and are now preparing for all the New Year festivities! 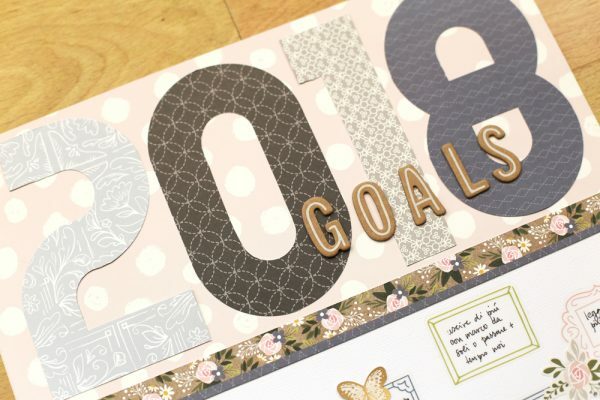 One of my resolutions this year is to inspire my daughter with a new scrapbook album that offers inspiration, affirmations and general messages for strength and gratitude. 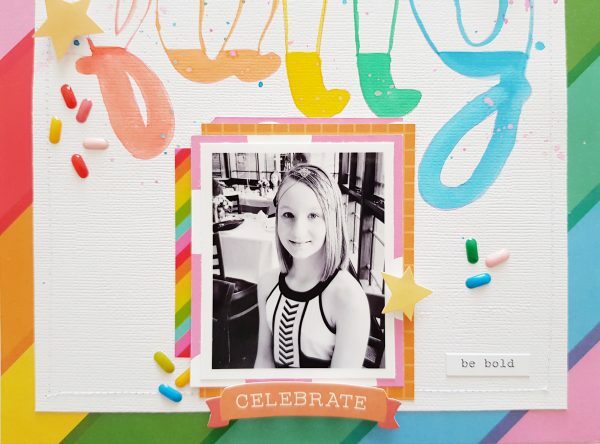 For the first page of her album, I wanted to remind her of her own resolutions for the year; to be brave, live fully and be bold! 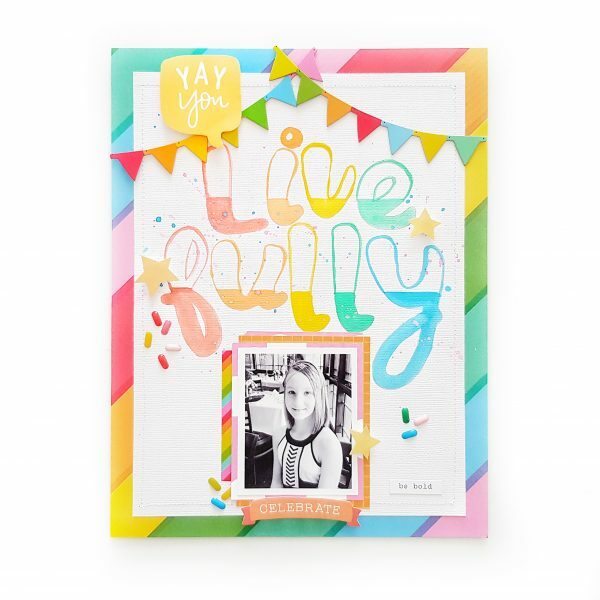 The Happy Hooray collection is so bright, and playful, and just perfect for this happy message layout! Isn’t this fabulous?! 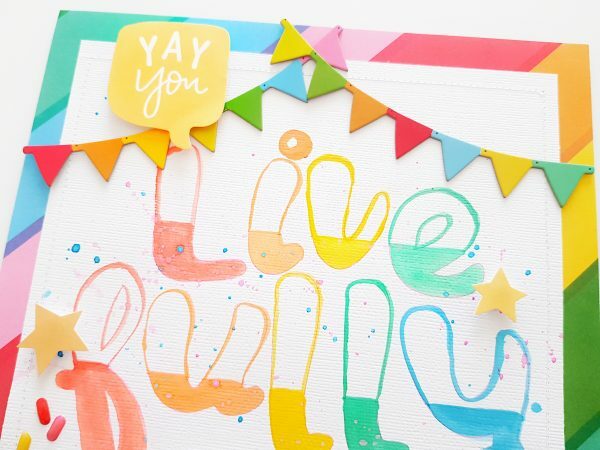 Live (color)fully, I say! I begin my layout with that fabulous diagonal stripe paper, Rainbowtastic! I trim this paper to the 8 1/2 inch by 11 inch size, and then cut my white cardstock to 7 1/2 inch by 10 inch. Before I attach the two sheets together, I use the Silhouette Cameo Sketch Pens to draw my title in pink ink. I then hand colour my sketch pen title with watercolor paints, which I try to color match with the patterned paper. I add a gentle flick of pink and blue paint for interest. Once dry, I use my sewing machine to stitch the cardstock to the pattern paper. 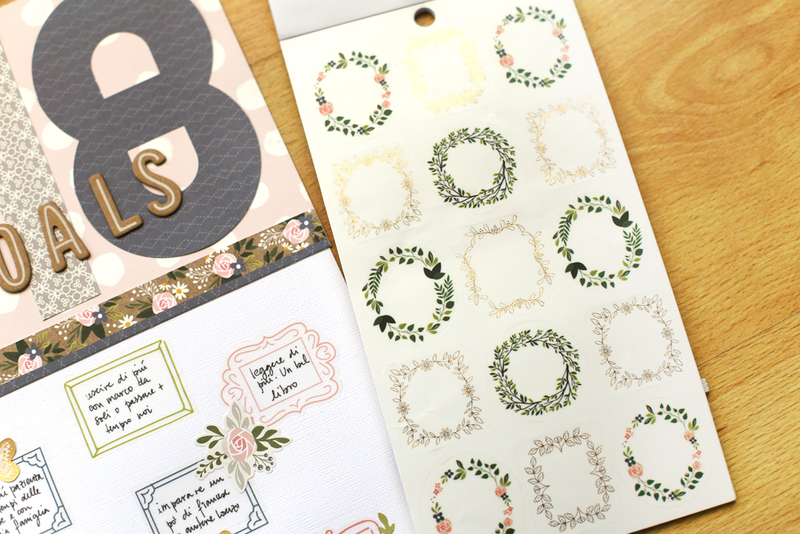 I embellish the top of my layout with the Thicker Stickers banners, as well as that super cute Die Cut speech bubble! And decorate the title with a couple Die Cut stars. My photo is 2 1/2 inch by 3 inch size, and is mounted onto pattern papers, Beary Sweet and Eat Cake. I partially secure it down with a strip of the rainbow striped Happy Hooray Washi Tape, and use my favourite Sticky Thumb Marathon Runner tape to finish the job. Foam Dots are added to my sentiment Die Cut, and positioned onto my photograph as a subtitle. Celebrate life! And nothing says celebrate more than scattered confetti sprinkles! (aren’t those Enamel Sprinkle Stickers the best?!!!) My final touch is to use my Typecast Typewriter to print my ‘be bold’ sentiment. Perfect! Such a beautiful page for my darling daughter! I hope it has inspired you to start thinking of your resolutions for 2018, and how to document them. Hi everyone, Heather Leopard is here and I am so excited for 2018 Resolutions week. 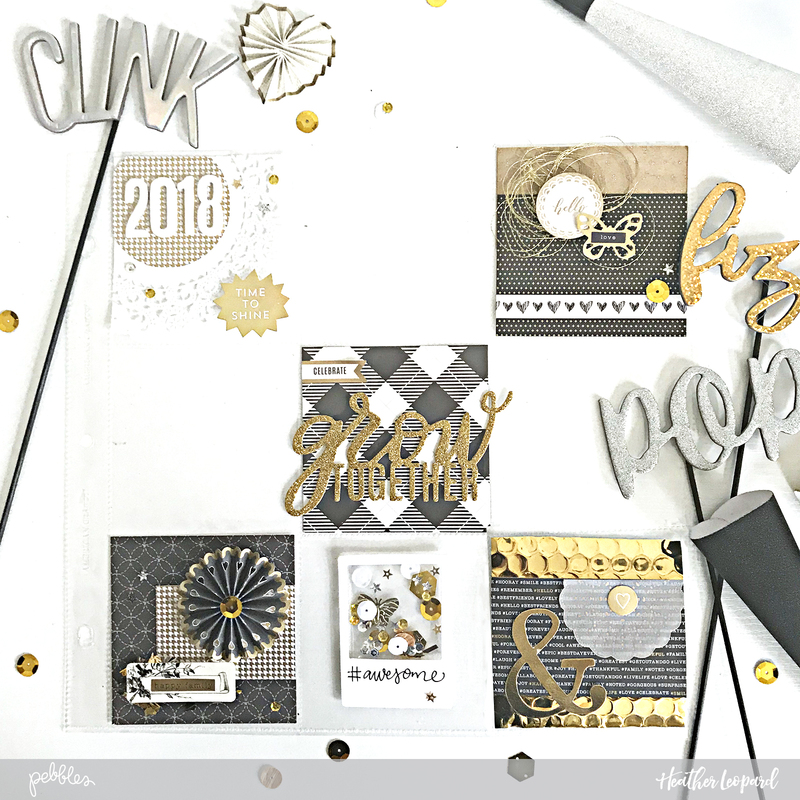 I thought it’d be fun to create a pocket page that will coordinate with a New Year’s Eve page you’ll see here on the blog next week. This pocket page will store our resolutions notes for 2018 that we’ll write on NYE, hence the empty spots. I used a mix of Pebbles collections that included gold elements, like Girl Squad, Heart of Home and Merry Merry. I even added some gold packaging from a recent mailer I received. This pocket page will also be the opening page for my 2018 album next year so it just made sense to add 2018 to the 1st pocket. I added a doily as the base and then just layered over it. 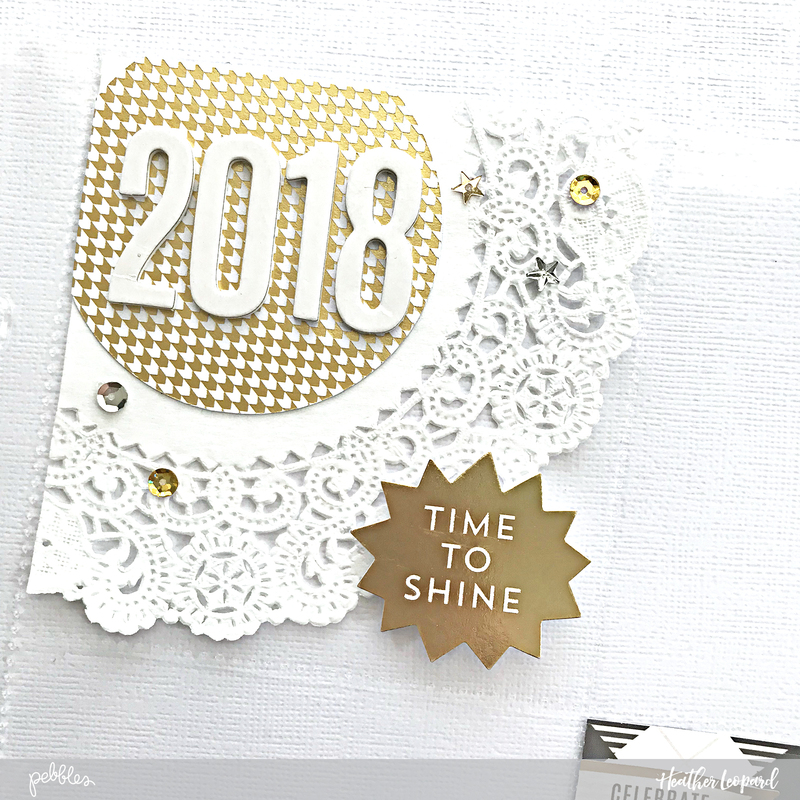 I was originally going to add “hello” to 2018 but I didn’t like the composition so I moved it to the next card, which was created using two patterned papers. Then, I added some thread and a butterfly embellishment. Since this is an opening spread to my family’s new year, the “Grow Together” sentiment was perfect. I used a rosette from the Valentine collection and just removed the Valentine themed sentiment and added a gold sequin. I placed it ocer layers of paper, tags and a sticker. I created a sequin pocket for this cute little frame. I added some sequins to a small jewelry bag, placing a few in the bag using glue dots so they didn’t all fall down to the bottom. Using my fuse tool, I made the bag to the right size of the paper frame. More tips on this can be found on my Instagram (@heatherleopard). I included an ampersand on the last pocket to show that our 2018 story will continue throughout the pages of the album. I was even able to align it so that the bubble wrap dots create a “…” after the ampersand. So that’s how I created my resolutions page to kick off my 2018 album. Tell me, do you do yearly albums and if so, do you create a page for each year? Terhi Koskinen here sharing inspiration with you, for the first time. This first layout I created for Pebbles is full of love, as I am too when I look at those sweet girls of mine in the photograph. The idea for the layout came from the photograph: When I printed it, I felt it was too dark. But as a clever girl I try to be, I decided to create layout hiding the darkest areas and highlighting the lighter ones instead. Let me tell you how I did it. First I told myself to calm down with the collection I was starting to work with: Forever My Always. It’s so sweet, full of such a beautiful and pretty details, the colors, the patterns! It’s all so, so good! The background for the layout was easy and quick to do. Knowing approximately where to set the design I had in mind, I flicked some Heidi Swapp Color Shine mist and then left over paint (Cotton Candy) and water mix I had on my worktable. The frames are cut with my Silhouette. I had some free flag cut files on my laptop, I picked one and added a hole for the photograph and cut it. As I love having three big elements on a page, I took three frames, added paper for two and photo for one. Then, using Sticky Thumb Dimensional Adhesive Foam I adhered the frames to the background. 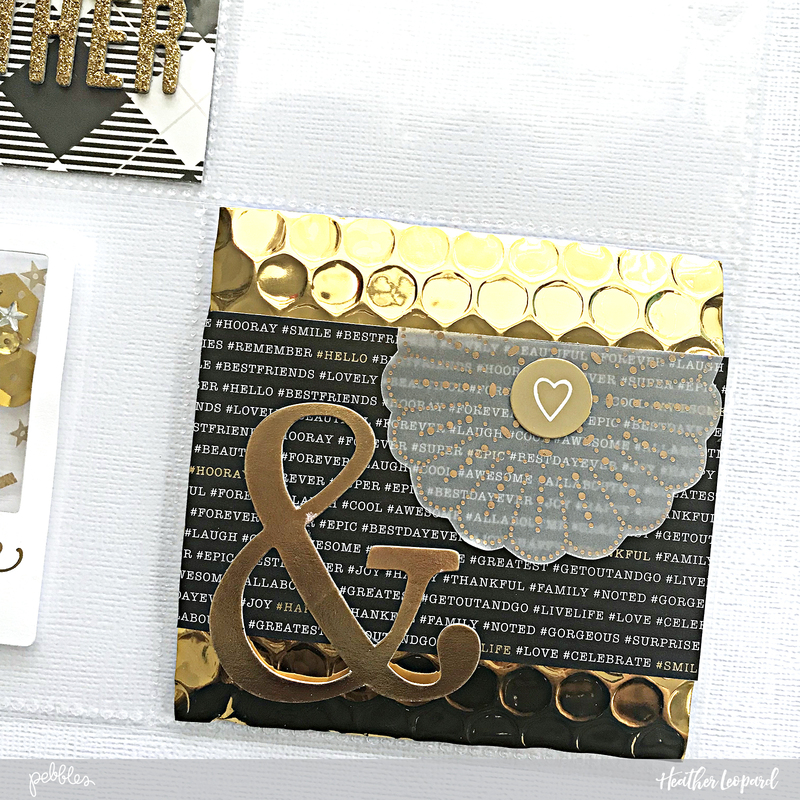 All the embellishments are from this same gorgeous collection, the cardstock ephemera can do so much. I cut and layered few of the die cuts, and to make some extra softness for the page, I added small amount of thread between the layers. The final touch came from the black enamel dots and doodling with a white pen. Hope you feel yourself inspired! Hello everyone! It’s Eva Pizarro and first of all I want to wish everyone a Merry Christmas, I hope you had a wonderful time yesterday with your loved ones. 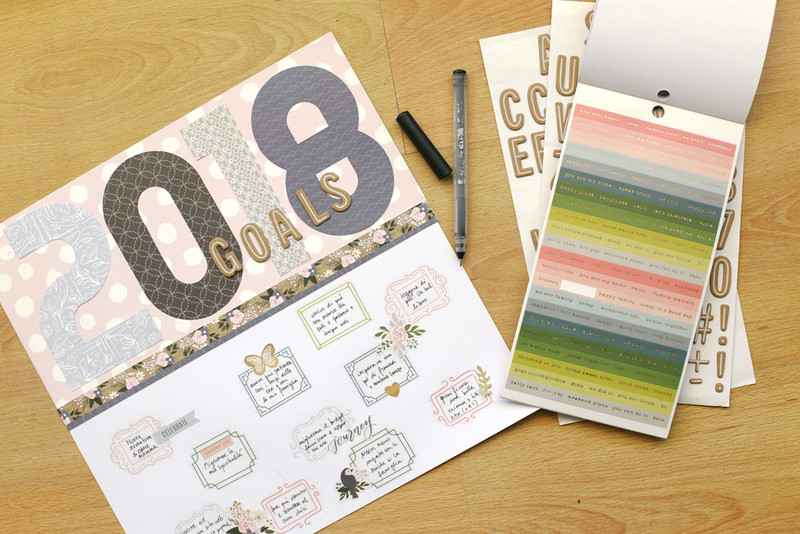 Today I am showing how to make a non photo layout to document your next year’s goals. 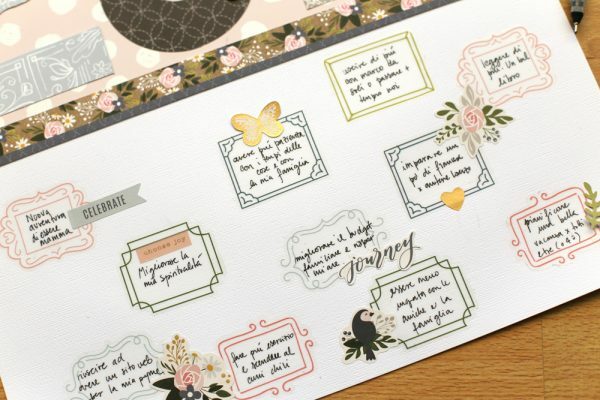 My inspiration for this layout was the AWESOME Jen Hadfield sticker book. 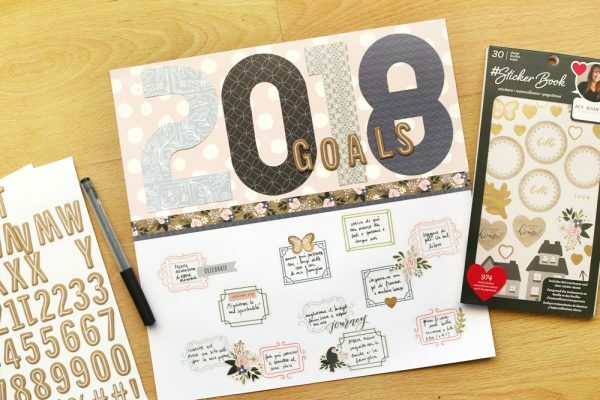 It has more than 600 stickers with phrases, gold foil and great designs. The stickers are perfect for you planner and to decorate your pages or mini albums. I saw some frame stickers and thought those would be perfect to document my year goals. I started my layout by making a big “2018” with my Alphabet Punch Board and some papers from the heart of Home collection. I also added the word “Goals” with kraft thickers. To journal my goals I wrote directly on my page and then put my sticker on top. I then embellished my frames with small stickers like little flowers and phrases. 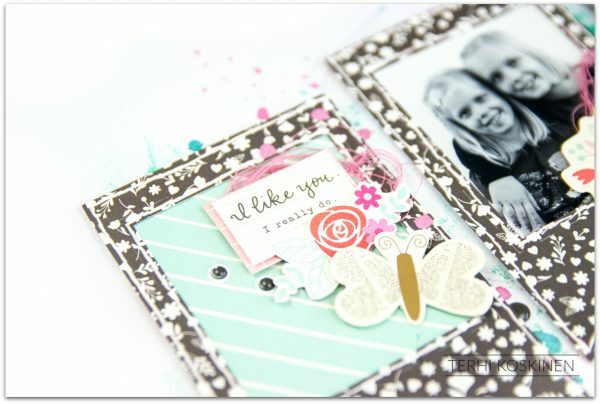 I love the subtle color palette in the Heart of Home collection, it is elegant and perfect for your everyday photos. Hi Pebbles Friends! Amanda here with my first official Design Team share! 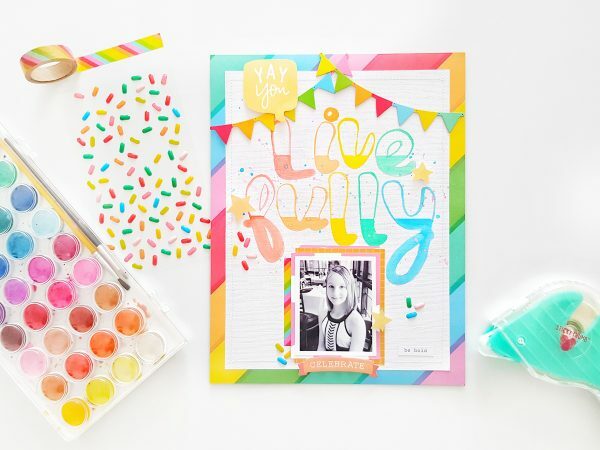 When I received my Pebbles Design Team kit, I was delighted to find the Happy Hooray collection – perfect for all our birthday celebrations! Then, before I could consider creating, it dawned on me that it’s only 3 days til Christmas?!! Oh me, oh my! Not to mention, I needed a last minute Christmas gift?! Never fear! Pebbles collections are always super versatile and I just love to get creative! 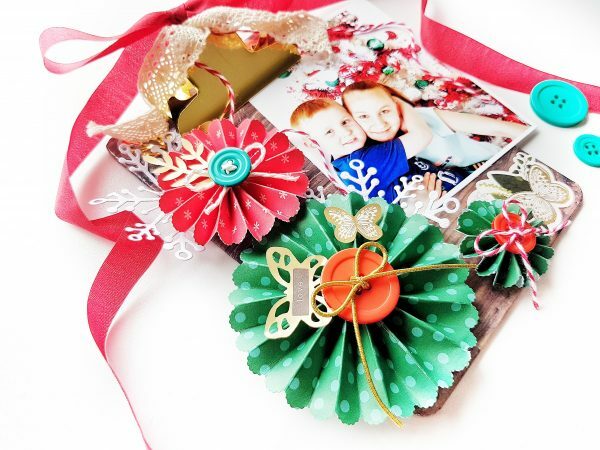 I had an American Crafts mini clipboard in my stash, and decided to alter it in Festive fashion…..
Oh isn’t this the sweetest last minute Christmas gift?! Because it is ‘last minute’ it’s super quick and easy to put together. 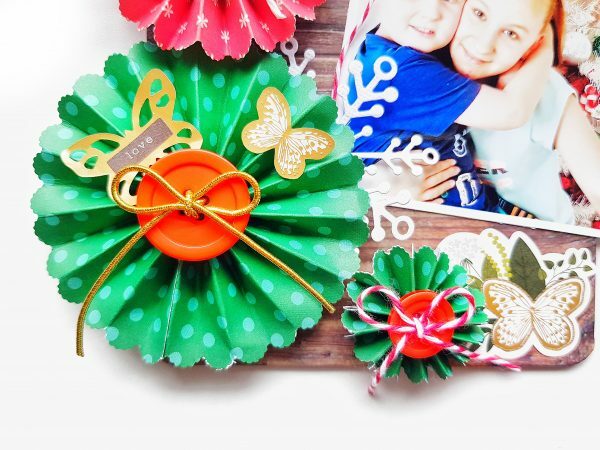 I cut a few pattern paper strips and scallop border punch one side…..
Concertina fold each scallop, and hot glue the two ends together to create my own paper rosettes. Tip: I like to add a lil extra hot glue in the rosette centers to really hold them in place. 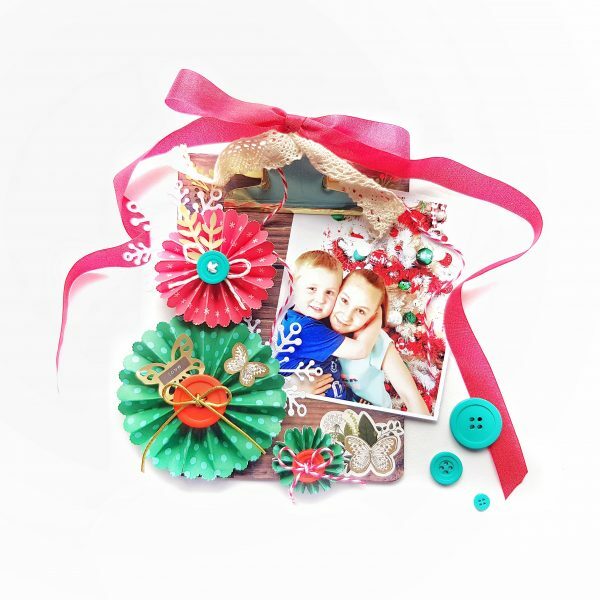 Embellish the rosettes with buttons, bows and those fabulous gold foil stickers from the Jen Hadfield Sticker Book (these beauties are at Hobby Lobby!). Voila! The perfect adornment for cards, tags, and in my case, an altered clipboard! 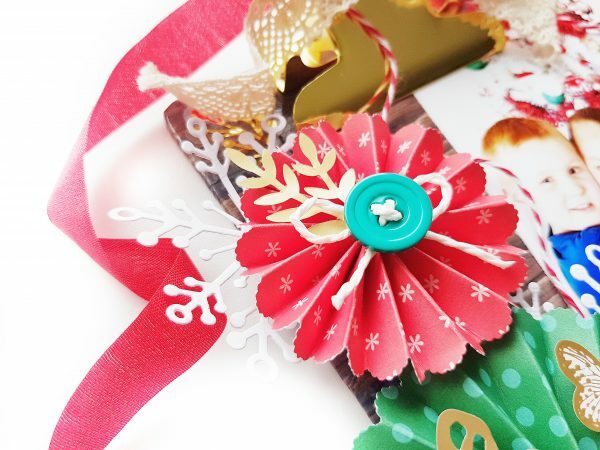 Add a couple of white die cut or cut file snowflakes, and attach to clipboard. Clip on your Christmas message, or favorite Festive photograph, & add a couple more of those sweet stickers. 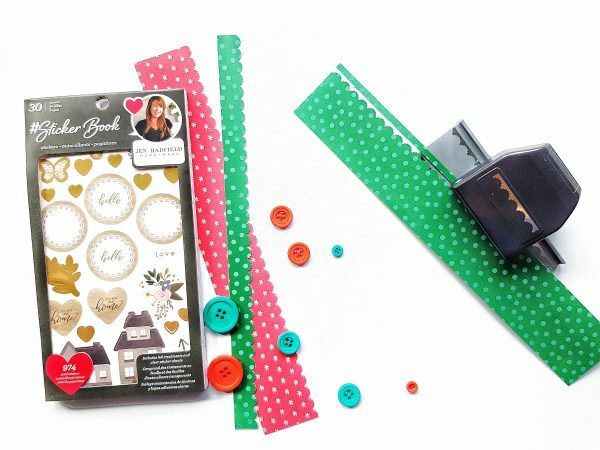 For finishing touches, add a few ribbons, twine or even lace bows to soften the clipboard. 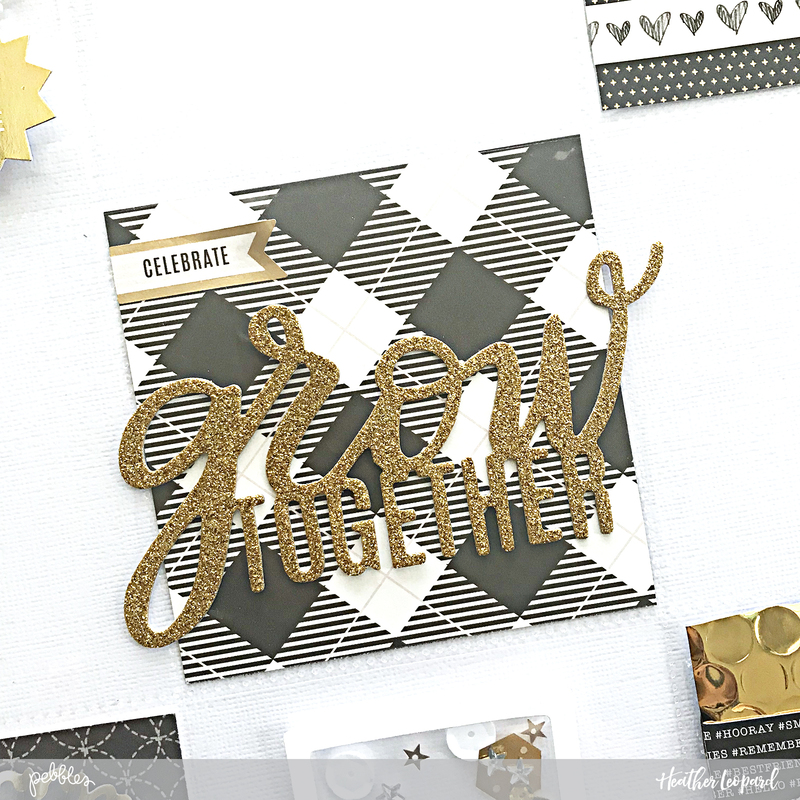 A super quick Christmas gift with the Happy Hooray collection! 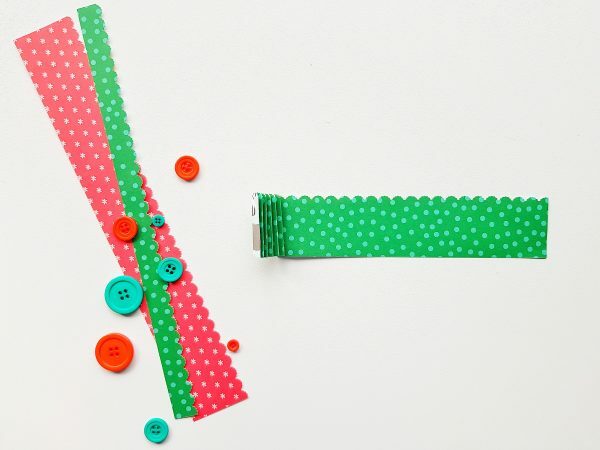 I hope you’ll give this quick craft a try!